Rajesh Nambiar used a blade to remove the metal button from her daughter's pair of jeans. 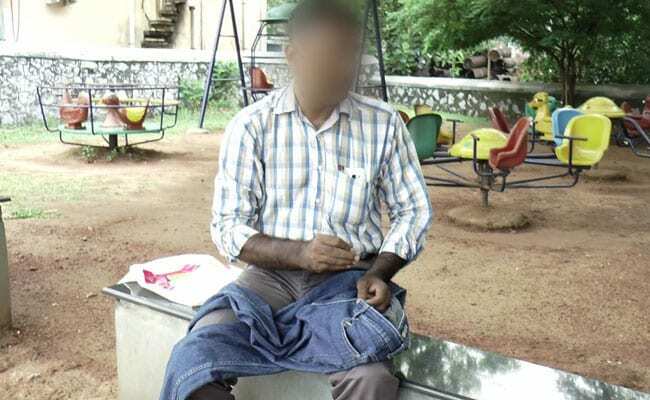 An 18-year-old in Kerala alleges she was forced to remove her bra and another student says she had to change out of her jeans at an exam centre for the NEET or National Eligibility and Entrance Test for medical colleges on Sunday. They were told it was for "security", to prevent cheating. When the metal detector beeped, a teen at a women-only exam centre in Kannur was allegedly ordered to take off her bra. With just minutes to the exam, she had no choice. "My daughter went inside the centre only to return a few minutes later to hand over her bra," said her mother, a teacher. She added that she had to travel 2.5 km at 8.30 am to buy clothes because "dark-coloured lowers weren't allowed". Many others went through the ordeal, she alleged. Lakhs of students across India took the NEET test for undergraduate medical courses. According to an official website, women candidates were to wear "light clothes with half sleeves not having big buttons or brooch/badge or flowers, with salwar/ trouser and slippers or sandals with low heels, not shoes." Complaints have surfaced from one centre in Kannur at the TISK English Medium School. Its principal, Jalaluddin K, said, "We have clear instructions that if the metal detector beeps, no one can be allowed inside. Whenever it beeped, we told students to remove what they have." He expressed surprise at the allegation that a teen was asked to remove her underwear. "I don't know where this is coming from," he replied, adding that he had called a meeting of those involved in frisking at the school. The father had to buy a new dress for her from a shop 3km away from the exam centre. A student who came in jeans at the centre was allegedly told its metal buttons are a problem. Her father Rajesh Nambiar, who works with the postal department, said, "She came back from security. I used a blade to remove the buttons and sent her back. Then I went to a shop about three km from the exam centre and bought a new dress for her after getting the shop opened," he told NDTV.